Holiday candy meets easy dessert in a two-bite treat! 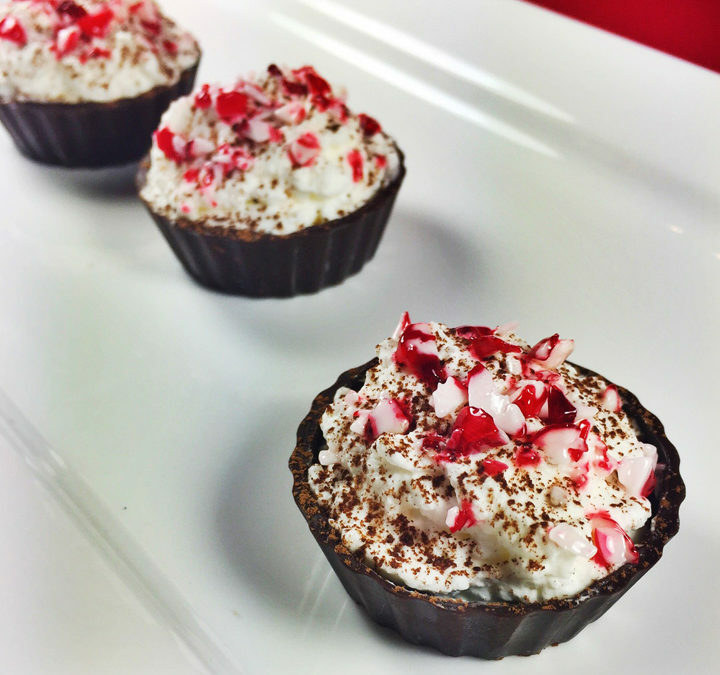 Our Peppermint Bark Mousse Cups are the tasty combination of cool peppermint and white chocolate mousse inside a dark chocolate dessert cup. Peppermint Bark Lovers will rejoice with this luscious sensation of a favorite holiday delicacy. Perfect for holiday parties and celebrations, and very simple to create, our two-bite dessert is sure to be a crowd pleaser for everyone. ChocoMaker Dark Chocolate Dessert Cups are available at Walmart Grocery. Whip the cream until it holds soft peaks. Beat the egg white until it holds soft peaks. Fold the white chocolate into the beaten egg white, then into the whipped cream. Spoon into the chocolate cups and refrigerate until the mousse sets – at least 1 hour. Dust with the cocoa powder and garnish with crushed peppermint. Any ideas on an alternate for the egg white? My son is allergic to eggs. Hi Kim, that’s a tough question, since it’s a mousse it needs the egg whites to add volume and aerate. You could try it without, they just won’t be as light.